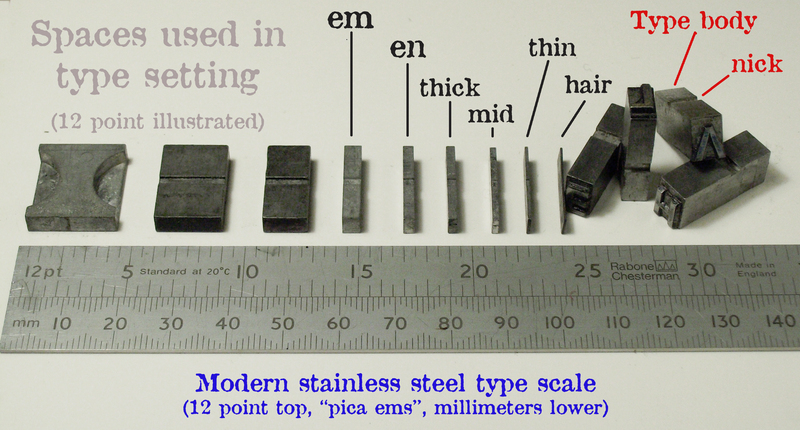 Movable metal type was originally set by hand for small and large printing jobs alike, until the linotype machine was invented in the late 19th century. Hand setting is still an interesting and productive skill, the basics can be learned in a few hours. 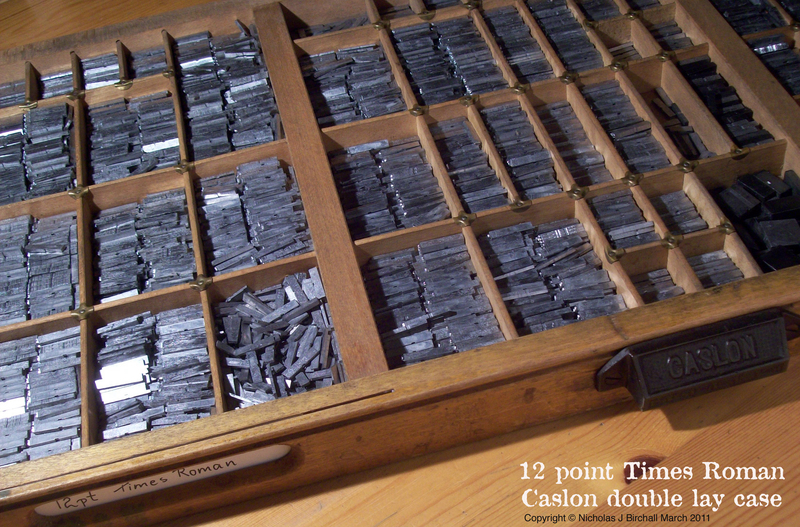 The printer’s double lay case is organised according to the frequency of each character’s usage. The most used letters are on the left and are centred in that part of the case and are NOT in alphabetical order. The right hand side is for the uppercase letters (capitals), these are in alphabetical order. The space used at the end of a sentence is an “thick”. This is the width of a letter “M” in that typeface’s point size. The space used between each word is a “thick” and is thinner than an “em”. Other spaces are in proportion and are called “thicks”, “mids”, “thins”, and “hairs” being the thinnest. Some very thin spaces are made of copper or brass. If the type is set to an exact “Measure” for example 18 ems (the 12 point “em” or pica “em” is a standard printer’s measure) The line of type when dressed out with the correct spaces will fit firmly and easily in the setting stick. 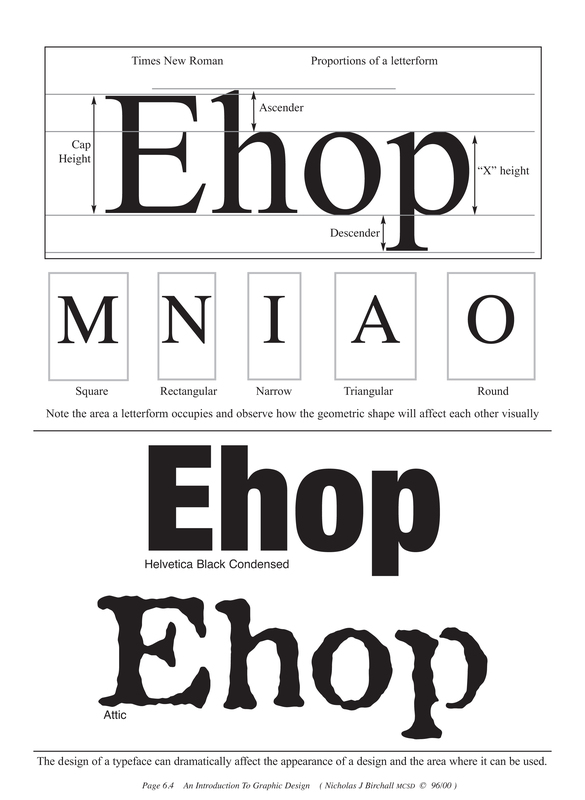 The “body” the type is mounted on is larger than the character (letter) and is the stated point size. The character will be smaller than the “body”. Some faces have added space around the character and will be denoted as 12/13 point for example (12 point type on a 13 point size body) This is particularly noticeable with cursive and script style of founts. The only exception would be a “titling founts” were the line would stand alone. This is calculated by the type designer (engraver/founder) to make body copy easier to read, with effectively increased line spacing. Often leading is added between lines of type. Leads start at two points thick and are cut to the setting length. The “body” of a typeface has to comfortably accommodate all shapes and sizes of fount in a given alphabet, Capitals, Lowercase, Numerals , etc. The ratio between “capital height” to “lowercase ascender” also “x height” to “descender depth” will vary from fount to fount. The body will have a standard height for a given point size, with the width varying to give a comfortable balance for the neighbouring characters. Always work from “clean copy”, the best example is 12 point typewritten, without corrections or deletions. Place the typecase at a comfortable height, the traditional compositor always stood at a bench to work. Set the setting stick to an exact pica measure, use a type scale, a setting rule (a brass rule cut to a pica “em” measure) or count out 12 point ems and lock the setting stick to that width. Start by putting one thick lead across the setting stick (6 point thick or more), this will help you pick up the completed lines of type. 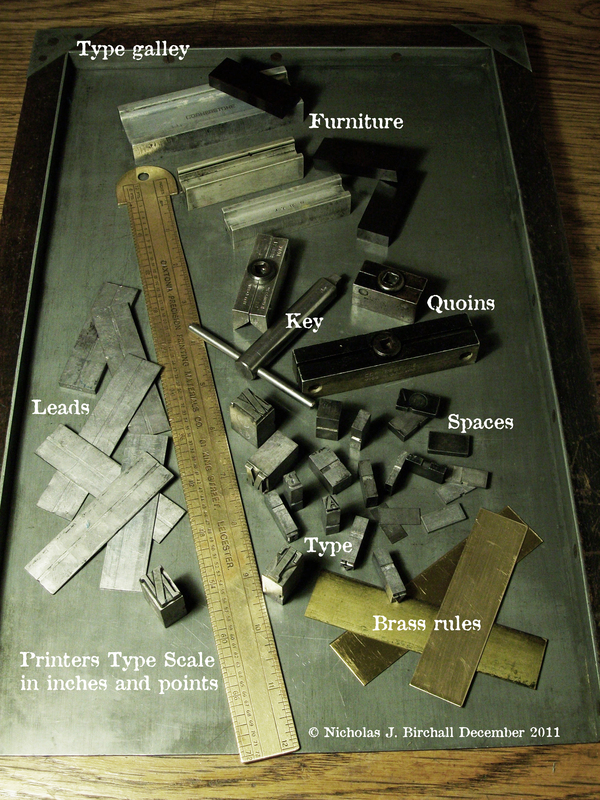 Hold the setting stick in the left hand and use the right hand to select the founts from the typecase. The angle the setting stick is held at is approximately 45º encouraging the type to slide down to the left end and back of the stick. At first use a caselay guide (figure one). Case layouts will vary from printer to printer! The lay of the case will become surprisingly familiar in a short time. Do not look at the individual founts as this will take for ever! Feel for the slot, the “nick” on the lower face of each body of type, this is ALWAYS AWAY from you. Pick the type up between the thumb and forefinger, the forefinger will feel the indent on the type body (nick). Our European writing system always starts on the Left & completes on the Right hand side. The line you are setting is upside DOWN but reads correctly, left to right and after a little time became a familiar method. Place each fount at the left hand end of the setting stick and keep the line in place with your left thumb, until the line is complete. Always try to avoid splitting words (hyphenation). Any looseness in the line should be taken up by adding appropriate sizes of space(reference figure two). Type can be arranged in four different ways. Rule: When centring always add the same size of space to left and right sides in progression. When the line is firmly “spaced out”, add a lead if desired, then work on the next line. When the setting stick is full, transfer the type to a “galley”, this needs to be done carefully. 1 – Place the galley on a flat, firm bench where it will not be disturbed. 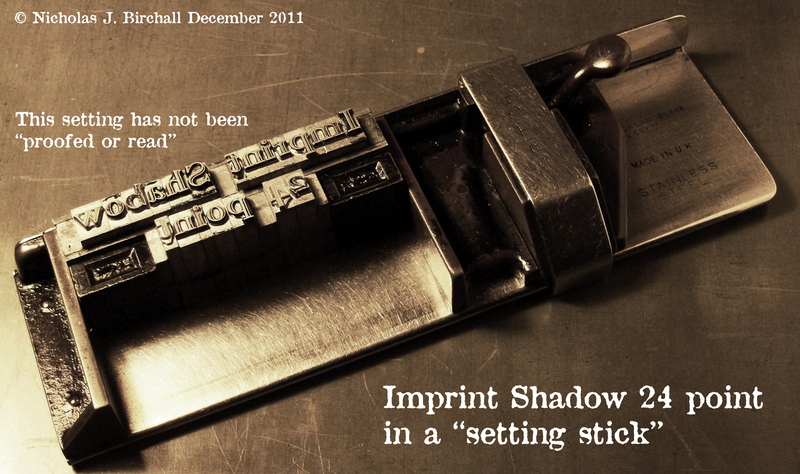 2 – Put the setting stick on the galley and ease off the slide lock, until the type is free. 3 – Hold the type with both hands, keeping firm pressure on the top lines, the base lines and both ends simultaneously (practices makes perfect)! 4 – Lift or preferably slide the type off the setting stick onto the galley. Move the type by gripping and sliding to the top left hand side of the galley and secure with “furniture” place on the outer and lower edges. The set body of type is known as a “forme”, for longer times of storage, wind typesetter’s cord around the type and “tie up”. If the type is secured by type setters cord a printers proof can be taken. Read the proof and mark any corrections that are needed for correcting spelling, punctuation, layout or swopping “wrong/damaged founts”. To lock up for printing, select a “chase” suitable for the press to be used. Place the chase over the type forme leaving the forme centred in the middle. The space around should be filled with printer’s furniture. Always aim to make an “H” shape around the forme of type and add similar sizes and lengths of furniture to each long side to make a uniform geometric shape. The furniture at the top and bottom of the type should be as an exact measure as the line setting length as possible (example 18 ems). In the remaining space place the “quoins”. It is best to put these at the foot of the type and one side only. Any smaller gaps can be taken up with leads or thin wooden furniture. Use the quoin key to apply a LITTLE pressure in sequence to all of the quoins… Do Not Fully Tighten yet! Take a thick flat smooth hard wood or plywood block which is larger than the type area and using a mallet tap the type down to even the printing surface. 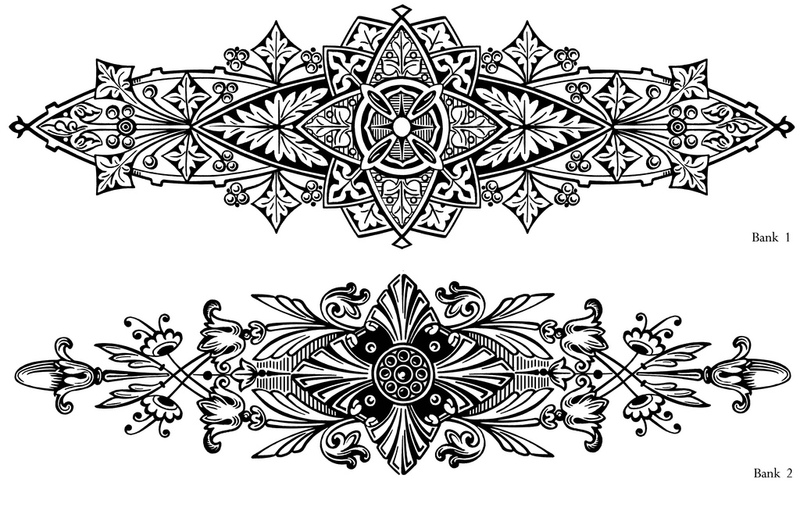 This was traditionally done on a “printer’s stone”, a large flat steel plate (a galley will do). Once the types have been knocked down, complete by locking the quoins in sequence. When all is locked up, lift the chase up slowly over the stone or galley. Did all of the type stay in place? If not, check where and why the looseness is and adjust spacing and re-lock. The last process is to ink up and print a first press proof! A n d N o w F o r P a p e r ! ! I am so pleased to see your very informative website on letterpress printing but can I please point out that the correct way to compose type in a setting stick is to hold it in your left hand at the adjustment end of the stick. Having the closed edge towards your body you insert each character, starting from the left, viewing it up-side-down (nick away from you) with your thumb supporting the end of the line while you take the next character from the case. Sorry about that error I will amend the image and description asap! Possibly shown that ways as I thought it was clearer! I learned letterpress in 1964, print shop junior high school. To this day my favorite class and instructor! You brought back memories of some terms I’d forgotten (quoin, printer’s cord, lock up) but I’ll never forget the term “pied”! Today in my graphic design business it’s all on the computer, but I’m glad a few terms have carried over like “leading” and “measure.” Of course today’s kids don’t realize leading of old actually caused cancer. You’ll probably enjoy a few of my monthly AmperArt pieces, those that relate to graphic design. Please spread the word to fellow designers and typographers. Yes I will be amending all those points thanks!! I liked your website Nick, being a old compositor, a few tips, type should be shown from left to right as it is easy to read. You need to amend your photo on page 2 to holding the setting stick in your left hand and holding the type with your left forefinger/thumb. Figure 6, turn the photo around as upside down and hard to read. Figure 8, turn the chase around so it is easy to read and always lock the form up with the head solid and quoins at the foot which is a better lock-up if you wish to do changes. Your website is very informative, well done, it just needs minor adjustments. Hi Nickgraphic, ‘The space used between each word is an “en”’, this is incorrect, one always starts with the standard thick space, that’s why the compartment for them is much larger. You have chosen a complex study of Letterpress Printing but all strength to you, trying to help others and create an interest in hot metal composing. Sadly a dying art, there are not many of us left. I even design book jackets today, or anything that comes my way, which is not much here, retired on the island of Crete at 82 years old. Overall your site to my way of thinking is excellent, it was indeed a pleasure going through it, memories! Damn! I don’t think there’s anything left to correct, others have beaten me to it, but what a wonderful trip down memory lane. Can I perhaps add the tedious jobs of scraping dried ink off brass rules and of dissing reusable type back into it’s case? Not forgetting the melting down of monotype and linotype the ‘boy’ (me) had to do when I first started. My family ran two printing businesses in Sunderland from after the war up until the 70’s, sadly technology caught up with them and they closed. I always said Caxton could have walked in and felt right at home! I completed my 4 1/2 year apprenticeship as a compositor in Winchester, Hants in 1979. Started out compositing but ended up on the company’s Intertypes (fake Linotypes). Moved companies to 2nd generation electronic typesetting (film strips, lens and flash guns), then eventually worked for Monotype. Years and years later I’m working with New York financial typesetters and before that, Scandinavian telephone directories (sadly they’ve passed into history now) … and I’m still using thins, picas/points, leading. It has to be the weirdest industry to have worked in where so much has changed and yet, somethings haven’t changed at all. 44 years in typesetting – I love it. Love the website! Hi Mark I trained in Graphic Design in Gloucester UK and we had formal training in hand composing. I never used letterpress comercially, spending most time designing for Lithograpy and silk screen printing. As the industry changed I retrained for DTP but moved into lecturing art and design. But by accident found my self back in letterpress!